Visit one of the most famous waterfalls in the Philippines on an easy day trip from Manila. With the help of your guide, embark on a ‘vertical hike’ down to Pagsanjan waterfalls, where you can then enjoy the cool water and relax. 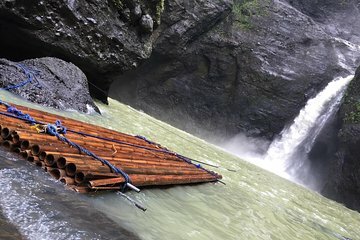 A bamboo raft ride is also included, and you can choose to go behind the falls into the ‘Devil’s Cave’, if you dare. A fun-filled day trip for adventurous travelers.